All 19 ModCloth coupon codes have been verified and tested today! When you shop with Modcloth you have 30 days to get a full refund on your order. Plus, all returns are free. Simply make sure the items are in excellent condition and use the free return label you can find on the website. Send back your item and get the refund right back to your account. You can also exchange your purchase for a different size, color, or pattern with an exchange request. 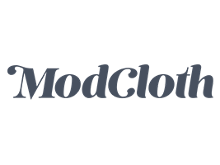 Send in your request within 90 days of your order date and Modcloth will make the exchange at no cost. Want to return your item but it’s been over 30 days? Modcloth gives you up to 90 days to get store credit plus a $5 bonus to spend on any item in the store once you send your item back. Get the inside scoop on the latest fashion trends and sales by connecting with Modcloth on social media. Start learning about all the newest products and best discounts it has to offer. You’ll find everything from outfit inspiration to flash sale details and Modcloth discount codes. Let the colorful patterns and vintage styles brighten your social media feed. You might even feel motivated by some of the fun, positive messages Modcloth regularly posts. You won’t be disappointed when you follow Modcloth on your favorite social media sites. Search for Modcloth on Facebook, Pinterest, Twitter, Instagram, and Youtube. Want even more Modcloth plus an added bonus? Sign-up for the Modcloth email newsletter and receive a Modcloth coupon for 15% off your first order. Don’t waste your money on shipping. Spend over $75 and you’ll receive free shipping on your order. Even sale items get you closer to not having to pay for shipping. Fill up your shopping bag and spend your money on things you actually want. Is your order less than $75? Keep an eye out for special Modcloth coupons that feature free shipping with no minimum purchase. Be stylish for your classes and save money for your textbooks by shopping smart with a Modcloth Student Discount. Register and verify your student status with UNiDAYS by signing-up with your university email address. The student discount will save you 15% on every purchase - no Modcloth promo code necessary. Plus this discount doesn’t take any summer vacation, so it’s available all year long. Need some shopping help? Let a ModStylist give you advice so you don’t spend money on clothes and accessories you’ll never wear. You can book a free online appointment for personal stylist assistance, bridal services, and even for help customizing the perfect wardrobe, so you can have the perfect outfit for every occasion. Modcloth makes it easy to book a consultation and the stylists are available via chat, phone, and email. Flaunt what you got - for much less! With a Modcloth coupon, you’ll save on all of Modcloth’s iconic, trendy, and vintage styles. Shop outfits that will take you from a picnic in the park to running your business and everything in between. One of the most popular deals popped up recently which featured 50% off of all dresses. With this discount, you could find all kinds of different dress styles with big discounts to match your ideal style, fit, and function. Look for it soon since it might appear again. Want to know where the discounts are all year long? Shop the sale section and you’ll find out that you can get some of the best deals without a Modcloth coupon code. Start with checking out the featured sale items. You’ll see great deals on products from all around the store for a lot less. Get tops, bottoms, shoes, dresses, and more for a fraction of the price. Discounts and deals change frequently so sign-up for the Modcloth newsletter to hear about all the latest sale promotions available. Want more spontaneity in your life? Modcloth flash sales are here to provide spontaneous sales and discounts on some of your favorite items around the store. You’ll find flash sales on different styles, fashions, and even patterns from chic dresses to snazzy boots and everything in between. A recent flash sale celebrated National Cat Day by giving cat-loving customers 25% off all clothing with cats on it. Some of the more popular items included cat-patterned handbags, sweaters, dresses, and even household items. The best part of all is you don’t need a Modcloth coupon code to get the big discount. Usually, during flash sales, the savings are immediately applied to all the qualifying items. This means you don’t need to worry about entering the code or searching around the web.